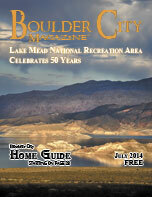 Happy Fourth of July, Boulder City! I'm sure if you asked almost anyone in town about their memories of Damboree from throughout the years, they would tell you some pretty exciting tales. Our yearly celebration is probably one of the most anticipated events all year, not only for Boulder Cityites, but for the people who have caught wind of our family centered activities and truly patriotic themes. Get ready for a step back in time as we recount musings from the Las Vegas Review-Journal on Tuesday, July 3, 1956:"Eighth Annual Damboree Set to Get Underway Tonight"
Tonight the eighth annual Boulder Damboree observing the 180th anniversary of the Declaration of Independence will get underway with an American Legion Junior baseball game scheduled to start at 7:30. The seven inning affair will be held at Boulder Memorial Field. Tomorrow, July 4th, the celebration will begin with a parade at 10 o'clock. Entries will form on Nevada Highway at the west end of the city and proceed up Nevada Highway to Arizona Street and then east on Arizona, disbanding at the junction of Arizona and Utah streets. Grand Marshal of the parade will be Col. R. E. Sullivan, commander of the Lake Mead Naval Base...The Nellis Air Force Base will offer a short concert after the parade in the park between the American Legion building and the post office. The Independence Day program is scheduled to start at 11 o'clock also in the park. Visiting dignitaries, city, county, and state officials present will be introduced as well as the Damboree queen. The afternoon program starts with the Bathing Beauty contest at 1 o'clock... After the contest, all types of races will be conducted for both adults and youngsters. Races to be held include wheelbarrow, foot, potato, three-legged, egg, sack and the climbing of the grease pole, always one of the features of the celebration. The celebration will be concluded at about 10:30 with a gigantic display of fireworks.